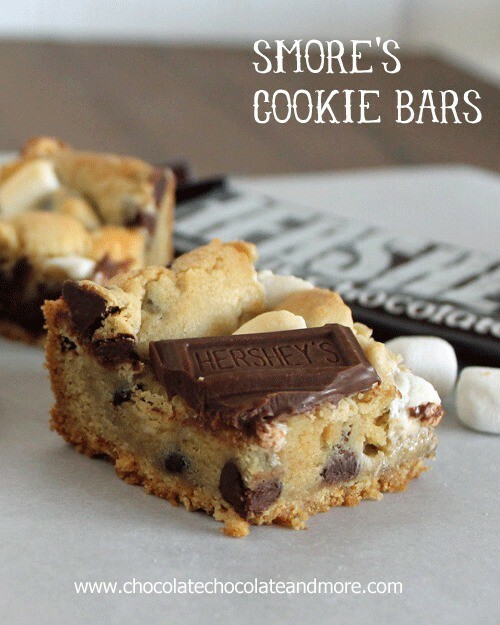 Smores Cookie Bars - Chocolate Chocolate and More! 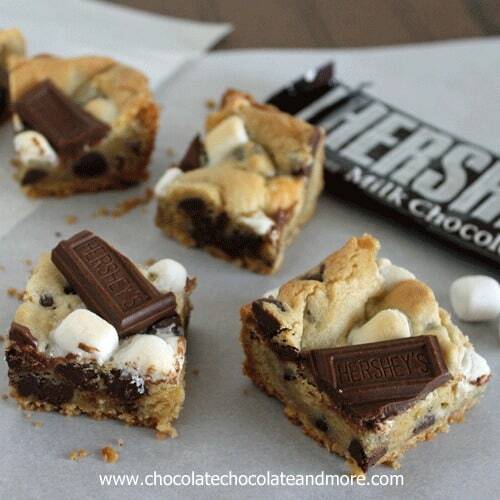 Smores Cookie Bars. Graham Cracker, Hershey’s Chocolate and marshmallow wrapped up neatly in a bar. I had to make these bars. My reputation depended on it. You know your kids are proud of you when they show your site off to their friends. My son came home the other day from school and asked me to make a treat for his class. My son is in High School! Really, I asked? Why? It’s almost spring, I don’t want to make anything Hot Chocolate right now. But my almost a man son has put my reputation out there. I have to make something, and it has to be good. Oh, and it has to travel well. And it has to look good because it’s not just the kids, the teacher was looking too. Hot chocolate, hummmm, chocolate and marshmallows….S’mores! I’ll make s’mores cookies. NOT! I made s’mores cookies, guess what happens to the marshmallows when you put them in the dough? The get all melty and run, and make an ugly cookie. “No they are not, they’re not pretty. I can’t have you taking something that isn’t perfect. You’re the one who showed your class my blog.” Yes they tasted wonderful, just like a S’more should and I’m sure the kids would have eaten them all and not even realized that they weren’t pretty, but I’m vain. Now people in his school know what I can do. We’re small town, If even one adult hears that I make ugly cookies….how will I able be able to show my face in public again. So I send my son off to school without the ugly cookies and the promise that I will have something for him soon. I have to thank the Girl Who Ate Everything. It was her S’mores Cookies that finally let me see the light. Instead of putting graham crackers in the cookie, use them as a crust! A S’mores Cookie Bar is born! Cream 1/2 cup softened butter, add in sugars and cream again till fluffy. Add in egg and vanilla. Mix again. Combine Flour, baking soda and salt, then add to butter mixture. Once all combined, fold in chocolate chips and marshmallows. Spoon Cookie dough on top of cookie crust as evenly as possible. Don't worry about spreading perfectly. Dough will spread as it cooks to fill in any gaps. Bake in a preheated 350 degree oven for about 20 minutes. Oh, and the verdict at school? I’m awesome! Reputation still in tact. If I wasnt falling asleep right now, I’d run into the kitchen and make these. 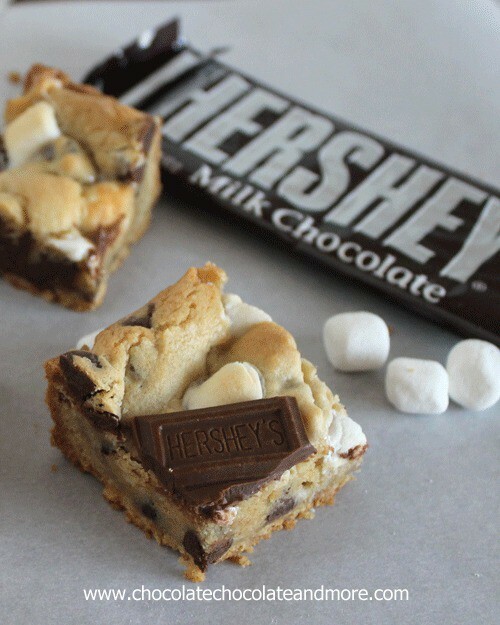 I want one now *cue pouting* Seriously I love anything smores, including these bars. Oh my… I saw the title and said “Oh no she didn’t”! But, oh yes you did! 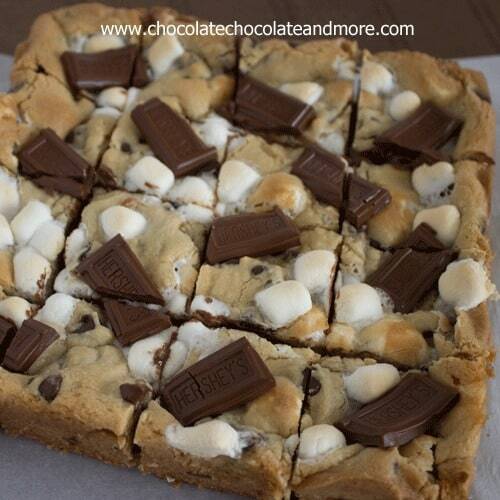 You made Smore’s into a cookie bar! You know I will be making these soon! I have been craving some homemade cookies, and these look so good! These look beautiful! Um….and PERFECT! I pinned them so I can make them soon! OMG these look amazing!!! I love smores. Ahahaha I loved this story! You had to fight for your rep! Wow, that is a lot of pressure Joan, but I think you came out looking pretty darn good! These are thick and beautiful! I love the chocolate squares nestled on top! And how cute that your son shared your blog with the whole class! These are gorgeous Joan! I want the whole tray! Joan, you’re killing me! I love s’mores. They look so unrelentingly gooey and chewy and totally perf. I want to be one of your son’s classmates! Or maybe the teacher to get the whole pan in return on higher grades! 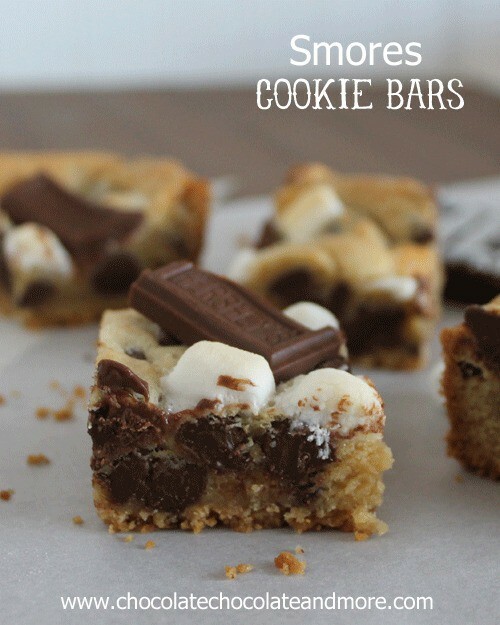 I love s’mores and chocolate chip cookies, so deciding to pin this was a no brainer. YUM!!! I love ALL things S’mores and this is certainly no exception. I plan on making these immediately, if not sooner. Thanks and double thanks! Joan these look SO good!! I love anything and everything s’mores. Making them into cookie bars is wonderful because it’s less fussy than making actually s’mores! Thanks Sally, and bars are just so fast and easy! I made these for a bake sale. We nibbled tonight on them just to make sure they were good enough to sell! Holy moly! They are divine! Even my three year old said, “mama, how did you make these so delicious?” and the five year old asked “what would happen if someone at ALL of these?” Great recipe! Thank you! This is a keeper! Oh my gosh these look ridiculously good!!!!!!!! I’ve made s’mores cookies before, but I will have to try to make these now, they look DELICIOUS!!!! The perfect summer dessert, thanks for sharing!!! These look delicious! I love how you can still see so much of the Hershey bar! Thanks for sharing at Monday Funday! Heavenly! I want to gobble them all up! hank you so much for sharing on Show Me Your Plaid Monday’s! O*M*G!!!! I’m gonna love these!!! Thanks for sharing with us over at Real Housemoms! 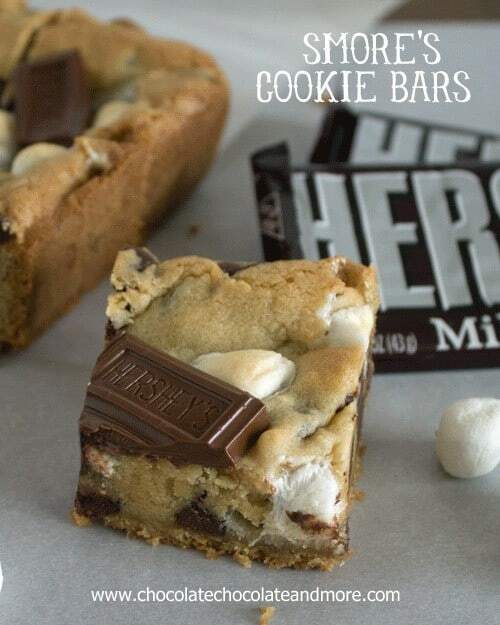 Pinning this ~ seriously, you put a Hershey square o anything and I’m SOLD! I’m with you Kim, I’ve always been a sucker for a Hershey bar! Oh my goodness! You’ve got me drooling all over the place! YUM! Okay – how can you go wrong with these delightful bar cookies – you can’t. Smile. These are going to be made VERY soon. Hope you have a wonderful weekend Joan! You can never go wrong with S’mores! You did a great job with these cookie bars! So decadent…I want a bite (or two)! Drool-worthy! haha that’s too funny, but I can totally understand. No way would I send an “ugly” cookie either!!! Bars are better anyway…more like a real s’mores. Love it!! A proud son, showing off his Mom’s work – you should feel great about that! Thanks Erin, yup, I was feeling all warm and fuzzy inside. And I’ve had a few requests for more treats so I must be doing something right! I just made these and they are awesome! I do have one question though, what size square baking pan did you use? I used a glass 9×8 and my crumbs only covered 1/2 the bottom so I added some more. Hi Deidre, glad you enjoyed them. My pan is a 8×8. That one inch shouldn’t make too much of a difference. but you did great, just adding extra. And these look SO good! I don’t even like smores or marshmallows but these look awesome. Thanks Erin! I’m not a huge Smore’s fan myself but the cookie holding it all together makes this the perfect way to enjoy the Smores package! Hi, Your recipe looks amazing! One teeny question: Did you use an 8-inch or 9-inch square pan? Thanks Bonnie. I used an 8 inch pan, I’m sure a nine inch would work just as well. made these this weekend (only suggestion is that mine needed to cook for longer than 20 minutes, prob like 35 minutes), and everyone went crazy over them. I gave a few to my boyfriend (who loved them!) brought them to a small dinner party, and then brought the rest to my family who wanted the recipe asap. I tried to take the remaining two pieces home with me and my sister wouldn’t allow me to take them. So good! and so easy. you mustttt make these. This will make 16 small bars or 9 large bars. I’m kind of puzzled .this is my second time making them and I can get them to cook through. I even had repairman come over to check my oven , thinking I might need to have it calibrated but it was within two degrees accuracy. Laurie, I’m not sure what to tell you. I use a 8×8 pan which makes a thick bar. You can increase the cooking time or you could try making this in a 9×13 pan for a thinner bar. I can tell you, If you like smores these bars are worth the effort. Laurie, I had the same issue with them not cooking through. I turned my oven to 375 instead for about 8 minutes and they came out great! My mouth is watering! If only I could reach in through my screen and eat one. Well, the next best thing, is to head into the kitchen and make a batch!!! JOAN, Did you use milk chocolate chips or semi-sweet chips? Can’t wait to try this recipe! Cheryl, I used semi-sweet but either would be yummy! Holly, I wish I was one of your co-workers! I was in your sons AP US History class and those were the bomb diggity! Thanks Shelby, glad you enjoyed them! OMG! I made these last night and had one for breakfast! Lol They were sooooooo good. The melted butter is for the graham cracker crust and then the softened butter is for the cookie. I hope this helps and I hope you enjoy these bars! I just made these and it was a HUGE GIGANTIC fail! I am a seasoned baker and can’t remember the last time something didn’t turn out at least decent enough to eat. I had to throw this out. The dough never cooked at all, even leaving it in for twice the prescribed time? I let it cool and it turned hard as a rock. What the heck?? I triple checked my ingredients and followed this to the letter. Hmmmmm…..
Tiffany, I’m so sorry you’ve had a bad experience with this recipe. Honestly, this recipe is just an adaption from most cookie bar recipes in that I didn’t want a large batch. I’ve made this recipe at least 5 times since publishing and haven’t had any trouble. I’m sure as someone used to baking you know your oven and if it runs a little hotter or colder and adjusted your temperature for that. Did your dough spread out as it baked? I’d really like to help solve this for you, these bars are delicious. What size square pan did you use? I used my 9×9 and had to increase everything by a half to “fill” it. Then they never cooked through. I left them in for an extra 15 minutes and they were less giggly when I took them out but they weren’t nice cookie texture. What went wrong?! I use an 8×8 square baking pan. I though i had the same problem as you, so I cooked it for a liitle longer before letting it cool. When took it out of the oven it looked cooked but was still very much soft in the middle. I left it to cool and it solidified a little and became the right consistency. Moral of the story, if you cook it for the 20 minutes and then leave it to cook reguardless the fact that it will still be soft, it’ll cool to become the right texture. The reason it probably cooled to become rock hard in your experience is because you let it cook for the extra time. Hopefully this helps you out if you give it another go. Its well worth giving it another try. I made these last night for a function at work – I made two batches: one in a 8×8″ pan and one in a 9×9″ pan. I did not line with parchment paper. Otherwise, I followed Joan’s recipe exactly, and followed the cooking time exactly. They came out perfectly! They definitely looked like a gooey raw mess when I took them out of the oven (I should have taken a photo but I didn’t). They sat until completely cooled. They were completely set/cooked through and easy to remove from the pan despite not using the parchment paper. They cut into beautiful squares! My coworkers loved them and 5 of them already been directed to this post for the recipe! Thanks Joan! Amazing end-of-summer treat! I’m so glad you and your co-workers enjoyed them Chantal! This is my fourth time baking these since discovering this yummy recipe on Pinterest. My friends,family, and coworkers have all enjoyed this recipe. Thanks for sharing! For my own health, I can’t subscribe to your blog. But oh my! These recipes all look divine! You are killing me. One day I will make these for a special occasion. You are killing me Joan! I can’t believe I missed this when you posted it the first time around! You are absolutely feeding my s’mores addiction….you know I’m going to have to make these! They look sooooo yummy! My sister and I made this together–we really liked this recipe, but definitely would make a few changes the next time around. First of all, we also had the problem with the graham crumbs not covering the bottom of the pan. I would use 1 1/4 cups with the same amount of butter (the bottom was greasy, so you definitely wouldn’t need any more butter). We also would switch the amounts for the chocolate chips and mini marshmallows, so use 1/2 cup chips and 1 cup mallows. I would also lower the temp to 325˚F or even 300˚F and cook it for 30 mins. Overall, this is a good recipe, but it seemed to showcase chocolate and chocolate is the least distinctive flavor in a s’more (to us at least). The Hershey’s pieces on top definitely give the bars that extra “umph” though–what a great touch! That’s what I love about any recipe Kendra, you can customize it to fit your personal taste! Thanks for sharing! This is the recipe that officially got me hooked on your blog! One day I wanted to make a quick and easy dessert, so I chose this. I made them and to say the least, I stumbled onto pure gold. I absolutely LOVE these. They’re now my go-to dessert for any occasion. (I even made them for a how-to presentation … And everybody loved them.) Every time I cook/bake something I ask my boyfriend to rate it. Out of every single thing I’ve ever made for him, this has been the only 10!!! Everybody absolutely loves these and they are seriously SO easy. Thank you for this fantastic recipe! I’m sure one day I’ll be teaching my daughter how to make them! (: …Did I mention they turn out just like the picture? LOVE THAT! Teeheehee. I was wondering if these could be made and then mailed to someone? and if yes what would be the best way to package them? But the calories, the calories make my belly sad. I made this for my works Valentines chocolate party. I read the reviews and increased the graham crumbs to 1 1/4cup, decreased the chocolate chips to 1/2 cup and increased the marshmallows to 1cup. I made it in a heart shaped pan and it turned out delicious!! Very one loved it. I will def make this again, thanks for sharing. I made these in a square pan like it says to. I assumed it was an 8 x 8″ pan. But when I baked them they were still way too gooey in the middle. I had to put tin foil over the top and bake for another twenty minutes so the top wouldn’t burn. Next time I will double the graham cracker crust and bake them in a 9 x 13″ pan. Not gonna lie, I was kind of disappointed. I just found these on Pinterest and I’m having a hard time holding myself back from preheating the oven. My older kids just gave up after school treats for Lent and I know if these are anywhere in the house, they will fail to keep that promise. Thanks for posting this — now I will go explore your blog. Could I bake these in a mason jar and ship them overseas to my deployed husband? I did cake in a jar, and it worked just fine, but just wanted to make sure that this would work too. what size pan? looks like 8×8 square? Yes, I used an 8×8 square baking dish. Made these for a family reunion. I followed the recipe precisely but I doubled the recipe and used a 9×13 pan. I had to increase baking time by about 10 minutes in order for the center to get done. After they were completely cooled and I cut them of course I had to try one and OMG they are wonderful!! I’m sure they will be a big hit with my family as well. Thank you for a great recipe!! These look divine. I tried to make these tonight, but had the same problem as a lot of other people. After 20 minutes, the dough was like liquid. When you take the pan out of the oven, is it supposed to be very runny or set? I’m sorry this didn’t turn out for you, the dough should be set when you remove it from the oven. These look awesome. What size pan did you use? I used an 8×8 square pan. I have a recipe that is very similar to this. (My Mom’s recipe). We call them Congo Squares. I will be adding the chocolate bars and marshmallows the next time I make them, just to give it a try. Hopefully they will turn out as good as they look! These should be cooked all the way through. They will be a soft cookie texture in the middle but not runny or gooey. Did you still use an 8×8 square pan or did you use a larger 9×13 pan? I made these in a square 8×8 pan and I see now that others have had a similar problem. The cookie dough layer was too thick and wouldn’t cook all the way through. I cooked it 5 – 8 minutes longer and that helped a bit but it was still too undercooked to take and share and look pretty. I will try it again with a few adjustments. I love the idea of the graham crumb crust at the bottom, though. I used an 8×8 square but you can also use a 9×9. hi, I am going to make these tomorrow, I was wondering what size pan you recommed using for this recipe?! thank you!! I used an 8×8 square pan but a 9×9 would also work. Happy Baking! I made thsee twice – the first time exactly according to the directions above. They were delicious and a hit! However, they were a little less cooked in the middle than I like and the graham cracker base was too thin. The second time I read the comments and made the following changes: 1 -1/4 cups graham cracker, 1/2 cup chocolate chips, 1 cup marshmallows, and increased cooking time to 25 min. They were really good and my husband wants MD to make cookie bars all the time! Thanks for the lovely recipe, it is a keeper! These were a hit with my girls! Thank you for the recipe. I will be making these this weekend and I am just wondering…did you use light or dark brown sugar? Thanks! I always use light brown sugar, in my area, dark brown sugar is hard to find. Enjoy! I found this recipe via Pinterest and OMG- by FARRRR the best dessert i have ever made, and trust me, i bake pretty often. My roommates were literally fighting over who got the last peice on the same night i made it! This will now be my go-to recipe when i want to impress my friends or just have a sweet treat. PERFECT RECIPE! This is a fantastic recipe! I’ve made it four times in the past week and half for various events. The first time it didn’t come out right and I realized it was because my flour was old, but after I replaced it they came out perfectly every time and I have given out this link a bunch of times. They’re super easy to make too. I didn’t use the parchment because I’ve put them in aluminum pans since I was bringing them places. I had no problems with them sticking. I will say that you really do need to follow the directions and let them cool completely before cutting. So glad you’ve been enjoying these bars, they are always a hit when I take them places too! These are awesome! I took them to a party and 3 people asked for the recipe. I was worried my tray would look empty because it’s a 8×8 pan but I cut them small and added some Hershey nibs throughout so it looked cute too. Great recipe! I was asked for it by several people. Hello Joan. These smores bars look delicious and I can’t wait to try them. I loved your story as well. Can the recipe be doubled and baked in a 13×9 pan? When I bake, it’s usually for a crowd and this would save so much time. Thank you for sharing the recipe. I apologize if somebody already asked this question. I didn’t have time to go through all of the comments to find out.